The educational tools that we choose often shape how we educate our students, so let's choose them wisely with one eye on the future. We create tools. Our inventions are everywhere, from important ones like the wheel to impractical ones like the pet rock. 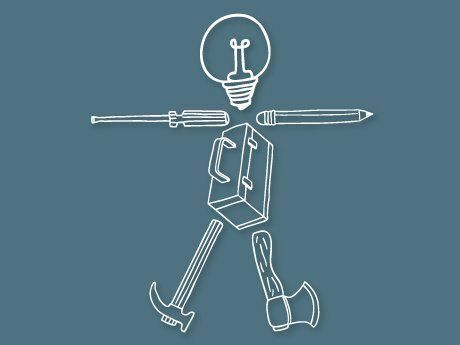 As silly as some inventions may seem, what's no laughing matter is that tools play a significant role in society. Tools shape society and us. If you think about it, making stuff is a two way street. We make our tools, but our tools make us. Long ago, we harnessed fire and it changed us by allowing our brains to grow. We made the automobile and it changed society into a car culture. We created the cell phone and it has made life -- well, I don’t need to tell you how life changed. The bottom line is that the tools we make change us for better or for worse. The same goes for education. The tools we use in classrooms change how we teach. When we think of a classroom today, the chalkboard might come to mind. As innocent as chalkboards may seem, they support the teaching approach where information is transferred in one direction from the teacher to the pupil. This is the sage on the stage model, and it is a teacher-centric approach. We have the Industrial Revolution to thank for this. Schools and education became a serious enterprise during that time. With the Industrial Revolution came the assembly line mindset and the ideas of uniformity, repetition, and specialization. This kind of thinking was in the air, and schools were not sheltered from it. We treated all children's brains the same and taught everyone in the same way. So lessons were drilled, desks were organized into rows, and subjects were separated. 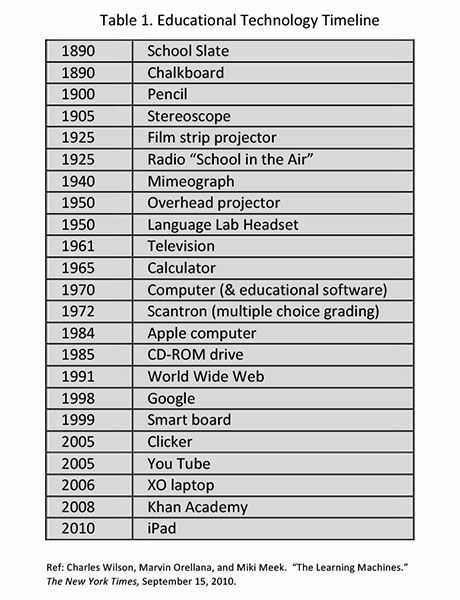 Education started to open up in the 20th century (see Table 1). 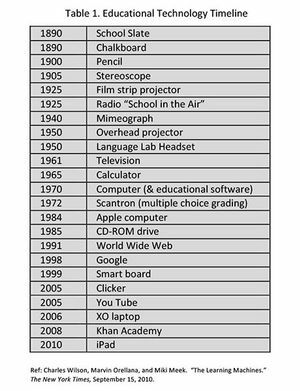 The creation of the computer and educational software moved learning away from the classroom to the learning-on-demand model. This is the path that was set by these tools, which the internet has enabled a thousandfold. However, not all tools help us. The invention of the multiple-choice test in the early 20th century, which was created to help us evaluate progress, has instilled a testing culture. Our tests were designed to serve us, but now we serve our tests. We create our tools, and then our tools create us. Now we are in an age of iPads, YouTube, gaming, and analytics, and the jury is still out on how they will ultimately shape education. One obvious early result from these tools is the flipped classroom, which positively changes the teaching dynamic from the teacher-centered sage on the stage to the student-centered guide on the side. Similarly, the invention of clickers is helping active learning to take root. These are all forward leaps in innovation and in learning. 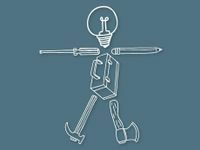 We must remember that tools do not play a passive role in education. Laptops, videos, and iPads are not innocuous means to record, convey, and disseminate content. These items can positively change teaching. But they also limit how we think about teaching, too. Once we have iPads, we create curriculum that is supported by them and might not be open to other (and sometimes better) ways of doing things. It is important to remember how tools can cloud our thinking. Just because we have a hammer doesn't mean that everything is a nail. This is why it is important to step back, think about our goals, and ask, "What do we want education to look like?" Let's not let our tools answer that question for us. Who knows, the best tools might be a combination of things that are old school and new school. It might be like a real toolbox containing an old claw hammer next to a newfangled laser tape measure. What they have in common is that they serve the common goal. This is why it's so important for us to keep that goal in mind. The classroom of the future may have opportunities where students are using their hands, because that's good for the brain. It might have attributes of "making" and play, because they support creativity and imagination. It may contain a digital means of sharing information, so that active learning can happen during class time. It might have an analytical part, because data can sometimes spot trends that humans might not be able to see alone. And my hope is that the classroom of the future will always have a teacher! So let us not forget that we shape our tools and that our tools then shape us. And let's choose the tools that are best -- and be brave enough to leave the rest.